Alex Collier was live via video stream on December 2, 2016. His twenty-second 90 minute LIVE webinar including more than thirty minutes of questions and answers. Hosted by James Harkin from AlexCollier.org and JayPee from WolfSpirit.tv (a subsidiary of WolfSpiritRadio.com) Alex presented some great insight into what is happening in this world and beyond. The webinar was hosted on Friday December 2, 2016 at 2pm EST. 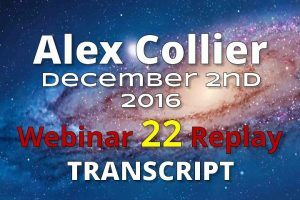 Alex Collier discusses many topics in this webinar including: Current State of the Earth and Solar System. Hi, my name is James Harkin and in 2011 I decided that I would create a website for Alex Collier since he had no direct Internet presence. The website is AlexCollier.org In 2013 I struck up direct communication with Alex and have helped him generate donations and help from his loyal fan base. In 2015 we started our first regular *LIVE* monthly 90 minute webinar and in 2016 we increased the number of live webinars held each month to two. 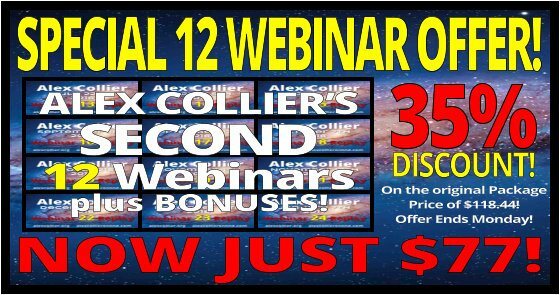 AlexCollierOnline.com was created to feature special offers for his webinars including: Webinar Videos, Webinar Audios & Webinar Transcripts. 78% of revenue (after PayPal costs) goes directly to Alex Coller. 11% goes to James Harkin (for administering the websites) and 11% goes to JayPee (for hosting the webinars & editing the webinar replays and promotional videos.) Thank you for your support for Alex Collier. It is appreciated.